Premiere: VIVID Sydney, Seymour centre, Sydney, NSW, Australia, May 2015. Codextant: Medieval Immersions in New England is a folio of works commissioned for VIVID Sydney in 2015. 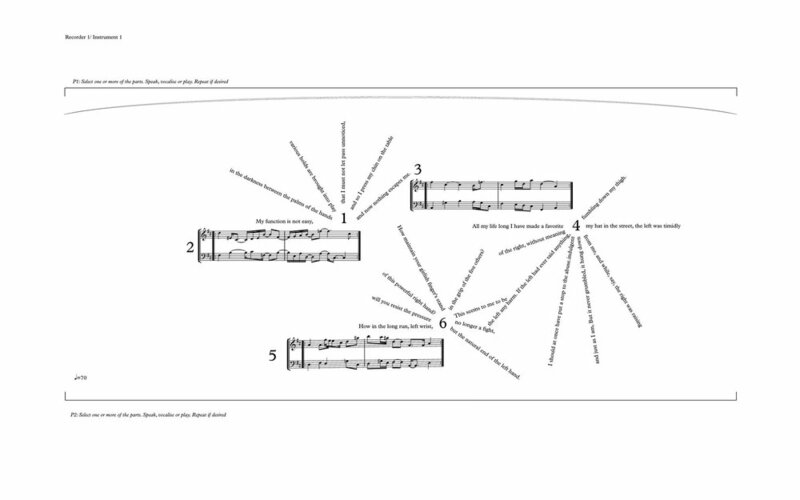 A collaboration between composer Eve Klein and The Australian Recorder Project (Alana Blackburn and Joanne Arnott) this folio formed part of a program entitled Senex et Sonis: Old Sounds which explores the recorder, its representations and its repertoire throughout history. Creating a crossover between the historical performance practice of early medieval and renaissance pieces and today’s contemporary electroacoustic environment, the performers create a synthesis of sound, through the juxtaposition of contemporary and early repertoire. Codextant is a folio of three works drawing from the sonorities of New England’s recorder history. It’s composition was funded through an Australia Council for the Arts New Work Grant. The folio recomposes Medieval music from the Llibre Vermell de Montserrat (1399) and the Chantilly Codex (1350-1400) for two recorders, electronic soundscape, and visual media. Multichannel surround sound textures are created from a dense soundscape of sampled sound environments recorded in the New England area. For over 800 years, the recorder has been used by composers to depict aspects of nature: that of love, birdsong and the pastoral. Its sweet tones can be associated with being ethereal, as well as being able to conjure the supernatural. The instrument’s wide-spread adoption in rural New England therefore creates notable parallels between local sound environments and the sounds which have historically inspired recorder composition. The most expansive work in the folio, both literally and figuratively, is a 4.5 metre long graphic score composed from fragments of the Chantilly Codex. Entitled ‘Between the Palms of the Hands’ the work juxtaposes text from Kafka’s Blue Octavo Notebooks with the iconic medieval manuscript and contemporary recorder performance techniques. In this context Kafka’s text highlights the competition between players hands, a metaphorical struggle for dominance, which parallels the recorder’s discombobulating relationship between contemporary and historical repertoires, techniques and tonalities. The folio’s other works showcase challenging dexterities for the performers on a range of recorders: contrabass, alto, soprano and sopranino. ‘Serrated Mountain’ recomposes sections of the song ‘O Virgo Splendens’ from the Llibre Vermell de Montserrat into a tuneful contemporary song exploring subtle rhythmic phase shifting between the recorder lines. ‘A Cage in Search of Birds’ rewrites a morning Magpie chorus and other birdsong from the Armidale cattle property Kyvana into a work exploring virtuosic extended techniques. This is an excerpt of a live performance at VIVID Sydney, 2015.